Baby Tiger - Did you call it a cub? Did you call it a cub? 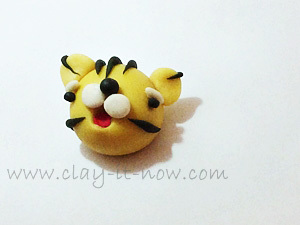 This baby tiger - you might call it a cub is very easy to make. We've made the figurine after seeing the picture at one of Korean blog sites. It would be ideal for kids project at school or at home during school holidays. And, if you are one of cake decorators you would love it because you can make this cute figurine in less than 30 minutes with fondant or sugar paste. 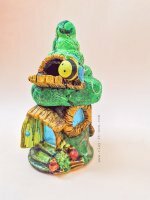 Follow one of my modeling clay recipes if you don't have any material yet. The ideal type of clay for this figurine is cold porcelain clay and soapy clay if you want to keep it for long and candy clay for edible figurine as cup cake topper or other cake decorations. Prepare light brown or deep yellow, red, white and black color clay. Head: condition your clay and roll it to a ball shape. Make a small hole for the mouth and let it dry. Body and Legs: roll your clay to a cube shape. Pull the two side of the cube to form a rectangular shape with the middle part thicker than the end side. Push the middle part of the two sides of the rectangular and then pull the four corners to form the tiger's legs. 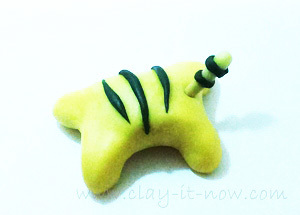 Tail: cover half of toothpick with clay and push it to the back of the tiger's body. Leave it to dry. Add the tiger stripes by rolling black color clay to couple of small tapered pipe/ sausage shapes. Paste it to the body and tail. Let's make the tiger facial feature now. 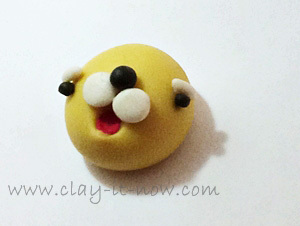 Roll a small red ball shape clay for the tongue. Push it to the tiger's mouth hole. Roll two small white color clay to ball shapes. Flatten it with your fingers and paste it on top of the mouth. 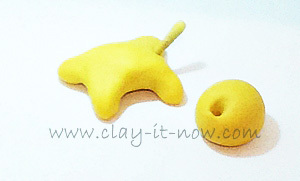 Roll black color clay to a ball shape for the nose and paste it in between the two white clay. And, roll two more black clay to ball shapes for the tiger's eyes. Add the eyebrow now. Roll white clay to a small and short pipe shape and paste it on top of the eyes. Finally, add the tiger's stripes on the head, cheeks and ears. Lastly, attach the tiger's head to its body. And, it's done! You have cute baby tiger now. 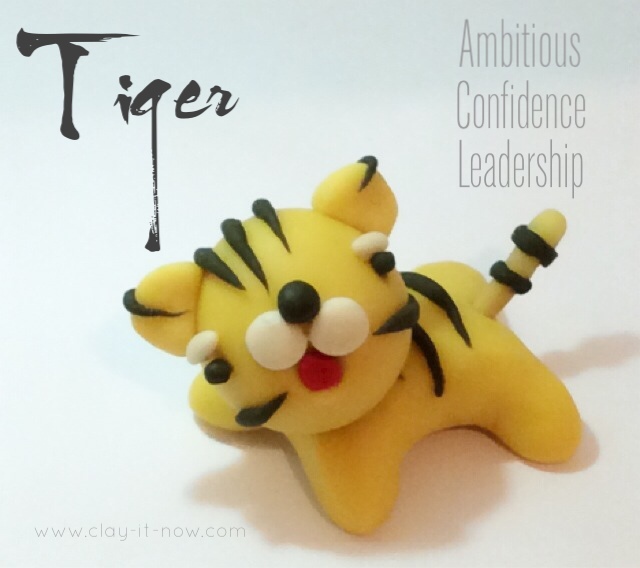 We thought the above tiger cub is easy for everyone who just started with clay crafts. But, we've received a query from a mom asking if we could make it easier for her kids. No worries! We have one. 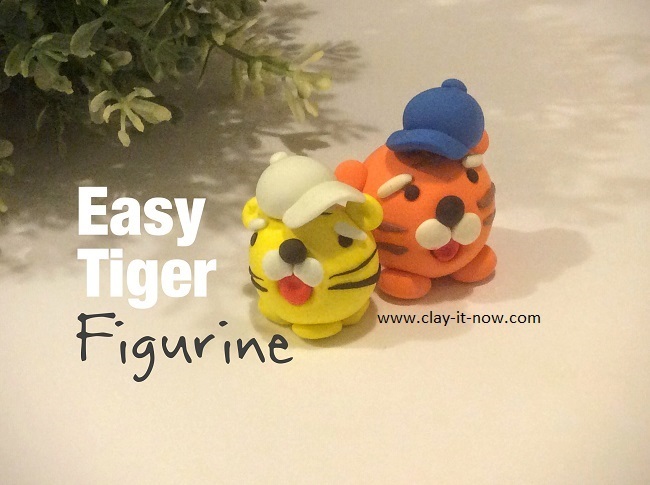 So, we've added a video tutorial to make an easy tiger figurine with basic clay shape. Click on the link to see the video. And, please subscribe to Clayitnow's channel for upcoming videos.